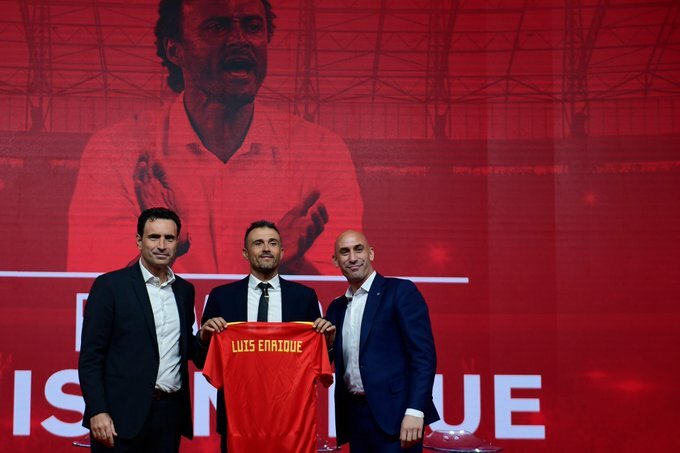 Newly appointed Spain head coach Luis Enrique said he cannot wait to assume the coaching reigns on a permanent basis promising to get the ship to start sailing as he was officially unveiled as the new La Furia Roja manager. Enrique was appointed as the Spanish coach taking over from interim coach Hierro who stepped down just 25 days after his appointment following Spain’s last 16 exit from the FIFA World Cup. Luis Enrique insists that Spain will maintain its playing style but with some changes. The former Spanish International played for Spain 66 times. He took part in three FIFA World Cups: USA 1994, France 1998 and Korea/Japan 2002. His coaching honours include 1 UEFA Champions League, 1 FIFA Club World Cup, 2 Spanish League titles, 3 Copa del Rey titles, 1 UEFA Super Cup, 1 Spanish Super Cup, all with Barcelona.